Found one file extension association related to Oracle BI Publisher and 1 file format developed specifically for use with Oracle BI Publisher. 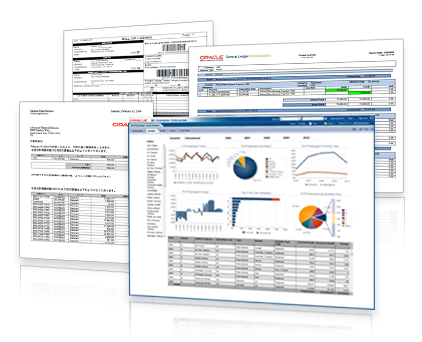 Oracle Business Intelligence Publisher (BI Publisher, formerly XML Publisher) is an enterprise reporting solution to author, manage, and deliver all types of highly formatted documents eliminating the need for costly point solutions. Built on open standards, IT staff and developers can create data models against practically any data source and use BI Publisher APIs to build custom applications leveraging existing data sources and infrastructure. End users can easily design report layouts using familiar desktop tools, dramatically reducing the time and cost needed to develop and maintain reports. Extremely efficient and highly scalable, BI Publisher can generate tens of thousands of documents per hour with minimal impact to transactional systems. Reports can be viewed online or scheduled for delivery to a wide range of destinations. If you need more information please contact the developers of Oracle BI Publisher (Oracle Corporation), or check out their product website.